Rithvik Dhanjani (the host) speaks about love, pyaar, mohabbat are complicated emotions of life and suggests they are not easy. He talks that this story is sent by Anandit Goyal for the Bindass Love Hero contest. Anandit is from Bangalore and had a one-sided love story. Bindass took his story as it had many shades. The story starts with Ankit anxiously waiting for Palak [Jeeta Tere Liye song plays] at the college and finds her going in the lift. He runs to see her another time by following the stairs. Palak finds a rose in a book at the library and wonders [Mere Bebasi song plays]. Ankit follows her and takes photographs without her knowledge. He later comes to meet the Dean and asking for a change in his course. The Dean eventually listens to him and puts him in pscyhology course though he is a topper in Maths. He sits in his class and soon finds Palak coming there. She comes to sit beside him and suggests of not seeing him and thinks he is from Maths department. He says yes and looks at her earnestly [Tum Hi Ho.. tune plays]. The story moves forward by 3 weeks and finds a college booklet with Palak’s photo with her BF who also earned the best couple. [Tera Emotional Atyachaar.. Hat Jaye song plays]. He crosses her BF’s photo and pastes his own photo there. Later, Ankit’s mom comes to know of the college booklet where he has put his photo with a girl. He manages to keep his mom away. He goes to college to find Palak having a talk with her BF Vikrant. Soon, he meets with a professor Abhijeet who assigns him for photography competition at college. He agrees to take photos and goes to look for Palak. He thinks on having opportunity and she comes to him and speaks of seeing him looking at her many times and regards him as secret admirer who can also speak. He opens-up about the photography competition – portrait and wants her to pose for him. She agrees to his request and asks him to not hide behind as it looks silly. Next, he begins to shoot and take some photographs of her at the terrace. She poses for him and he asks for different expressions – after seeing chocolate/ice-cream, angry. He thinks her left profile is much better as he always knew. She learns that he took pics of her without her knowledge. She thinks he is stupid and soon he confeses his love for her and even opens-up on choosing the psychology class only for her. He tells him to move back and makes it clear that she likes Vikrant her BF. He then speaks of knowing lot of things about her – icecream flavor, panipuri wish of her at 11:00 am. He then suggests that Vikrant is an idiot and asks her to leave him since he cannot love her more than him. She thinks he is crazy in head and asks him to leave. He pleads her to listen and soon realizes he has scared his own love. He wants to make things right and working. [Aasan Nahi Yaha song plays]. Later, he calls Palak but she doesn’t accept his call. He looks for her at the college but in vain. She gets another message from him and Vikrant learns that Ankit has sent her 100 message and missed calls. She goes to meet the Dean and informs about Ankit’s behavior. The dean recollects meeting with Ankit earlier and wants to suspend him and if needed police complaint. They leave after getting assurance. Rithvik (the host) speaks that Ankit’s obsession have grown a lot and even the dean has suspended him. Whether he is going to control his obsession and repair the damage ? All these answers were with Abhijeet sir who will become his love hero. He speaks of healthy love and unhealthy obsession and where to draw a line. He suggests its not a good thing to sneak into someone’s life and privacy. Abhijeet comes to Ankit’s home after his mom called him. Ankit comes there and becomes annoyed with his mom. Abhijeet asks Ankit whether he thinks is it right to take pics of others without their knowledge. He informs Ankit on stopping the police complaint. Ankit speaks of loving her and didn’t have the courage to say to her. Abhijeet speaks that he doesn’t have the right to invade her privacy and this is the wrong interpretation of love and knows that Ankit will agree with him. He asks Ankit to listen him carefully and suggests that true love doesn’t die and it could be affection and kind of happiness provided it is unconditional and true. For instance, his mom loves and takes care of him since birth. Her concerns for him are still there. He reminds Ankit on his actions which were disgraceful. Ankit learns about his mistake and apologizes to Abhijeet. Abhijeet wants Ankit to apologize to his mom and even to himself but he should not spoil beautiful emotion of love. He tells Ankit to meet him for 1 hr every day and he will help him in dealing with the situation. Ankit apologizes to his mom and gives his promise on making this fine. [Shikatein Mitane Lagi song plays]. Ankit looks at the photo of Palak and recollects some moments of her. Next morning, Palak finds Ankit at the college and wonders how is there. He goes to Abhijeet’s office and speaks of coming there to return Palak’s photo which he took without her knowledge and even her photos for the competition and also gives back the negatives. He speaks of realizing his mistake. Palak comes there and speaks to Ankit by excusing Abhijeet from there. She suggests if he promises to not trouble her again then she can go to the Dean and makes a request for his suspension to be revoked. She is doing such a thing because he is a good student and deserves second chance. He apologizes to her and she suggests he should say sorry to himself. He asks whether he can keep one photo of her which was the first one. She takes it back and speaks of returning it once he changes himself fully. He speaks of his believe that she will definitely return the photo and that is his promise. [Shikatein.. Churaya Tha Jo song plays]. He looks at college board and Palak comes there and finds him and smile. Vikrant comes there and thinks Ankit continues to follow her and tries to have a fight with him. 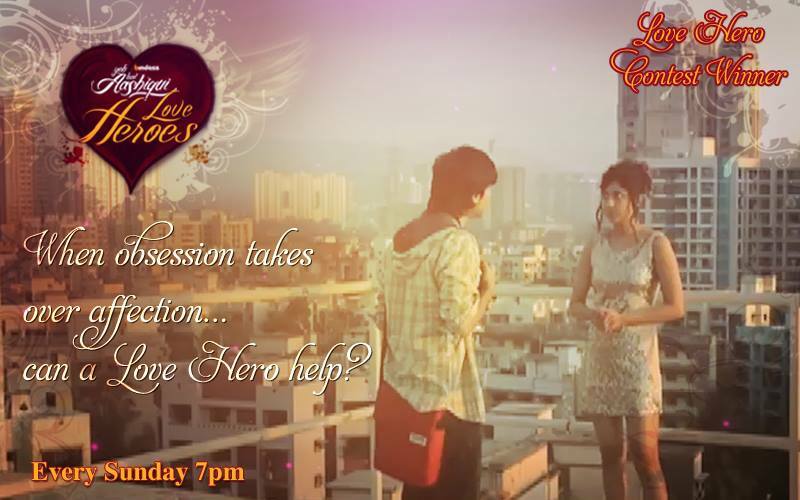 Palak rescues Ankit from him. Later, Ankit tries to avoid getting in touch with Palak and Abhijeet comes to know of it. Rithvik (the host) speaks that Ankit is a changed person after he listened to Abhijeet sir and was using his energy and time appropriately and realized his mistake and was trying to change truly and for good. He suggests Love hero is the one who shows you the right way to love. Later, Abhijeet greets Ankit and congratulates him for the photography competition. Soon, Ankit learns that Abhijeet sir have applied on his behalf and even used the negatives which he gave him earlier. Abhijeet asks about the final round and thinks he wants to take palak’s photo once again and shows displeasure. Ankit speaks of realizing one thing when he was stalking her and learnt at that time she wanted to raise some money by doing an internship and wants to arrange money in order to go to USA. Ankit wants to do something for Palak in her finance and suggests that his feelings can be unconditional but he is not worried about the result. He wants to have the shoot with Palak in the presence of Vikrant. Palak comes to know that her photos shot by Ankit have won the preliminary rounds. Vikrant asks her to not think much on finding beautiful photos shot by Ankit. She finds Ankit and tries to talk with him but he avoids her [Tere galliyan song plays]. 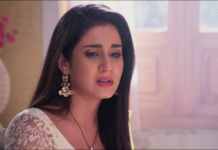 Later, she meets Abhijeet and informs him of trying to meet Ankit but he runs away after seeing her. Abhijeet asks what’s her call if Ankit takes her photos for the finals. She replies on loving it and Abhijeet speaks that Ankit wants Vikrant’s presence at the shoot. She thinks Vikrant will create problems. Nonetheless, Ankit takes the shoot of Palak and Vikrant and shoots their small fights and playful and candid moments. He tells them on how to pose and starts taking photos [Yeh kaisa Tera Ishq Hain.., Saajna.. song plays]. She asks for water and Vikrant goes to bring it while speaking bit rudely with him. Palak asks Ankit whether he continues to love her. He speaks of not knowing but its true. He asks her to not worry since he is not asking her for anything but his feelings are unconditional and has learnt about them from Abhijeet sir. Both share eyelocks on that note [Main Hoon.. Hain Tere Jastaju song plays]. He asks her to get back to poses. But she doesn’t smile and he then persuades her to smile by touching a bit but Vikrant comes and pushes him away and takes palak with him and leaves. Abhijeet goes to Ankit’s home and slaps him and thinks he will not change for repeating the same activity. Ankit replies of not touching her and it was just a reflexive action and he took candid shots of them and was happy to see them together. Abhijeet apologizes for thinking him as wrong. Next morning, Abhijeet informs Palak that Ankit’s photos have won the final round and gives her the share of prize money. He compliments on her poses with Vikrant and suggests they looked fine as the photographer’s intent was honest. Moreover, he informs her on Ankit’s decision to stop being a photographer. She doesn’t want to accept the prize money and goes to meet Ankit to return the money. She meets him and he speaks of getting the model’s share from the organizers but she continues to insist on not taking the cheque. He asks her to accept the money if she considers him as a friend and also there is one condition that she needs to have a coffee with him once in a month. She also takes a promise that he will not leave photography and he agrees for it. The story ends on that note with Ankit realizing about his love while accepting Palak’s feelings. Rithvik speaks about the thin line among friendship, love, affection and obsession which we should not cross. We should not intervene in someone’s privacy and thinks that love’s interepration should be right. Anandit Goyal whose story was presented in the show is the guest and he speaks on how he has channelized his energy and became a much better person after realizing about his one-sided love story and understanding the right interpretation of love thanks to his mentor or love hero. Rithvik signs off by informing the viewers about Bindass new show Zindagi wins. – Made his debut by working in Bindass’ Love by Chance Episode. Recently worked in Star Plus’ Everest – part of cast who took part in N.I.M training. – She worked in the role of Arunima in Channel V’s Heroes-the fightback files and Gumrah Season 4 [as Sania], Bindass’ Yeh Hai Aashiqui [as Prakriti] and Love by Chance [as Saloni] Episodes. – Follow the tag – Nida Chakraborty Actress to read articles written on the episodes where she had worked. Previous articleSharad blurts Soumya and Yuvraaj’s sated truth to Suhani in Suhani Si….